I loved the first few sentences. They immediately drew me in: "For eight years I dreamed of fire. Trees ignited as I passed them; oceans burned. The sugary smoke settled in my hair as I slept, the scent like a cloud left on my pillow as I rose." Unfortunately, that was my favorite bit of writing in the whole book. Not that it all went downhill from there; it just wasn't as beautifully written. The plot revolves around a young girl named Victoria, a former foster child just starting her life in the real world. 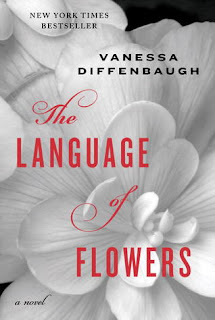 Her uncanny knowledge of flowers (and their meanings) helps her find a job and a boyfriend, but when life throws her a curveball, she isolates herself and struggles. Her antisocial tendencies, difficulty trusting people, and childhood memories plague her and threaten to pull her under. Victoria's story was interesting and worth reading and I liked the back and forth between her life at 18 and her life at 9. But it was hard for me to understand the characters and their actions and because of that, I wasn't very invested in the story. I won't go into details because that would give too much away, but you get the idea. It wasn't my type of book, but it steered away from the sappy drama territory it was headed in and became a fairly good read. NOTE: I read this book in December 2011.